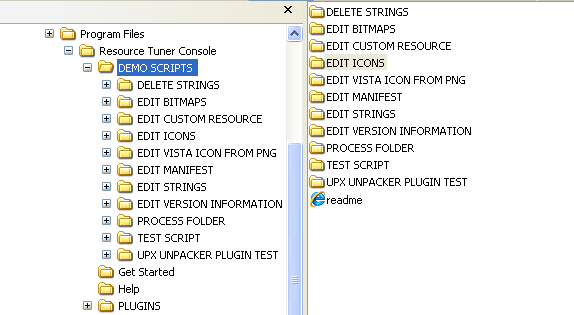 Resource Tuner - Guide To Using Scripts and Making Changes in the EXE DLL file. 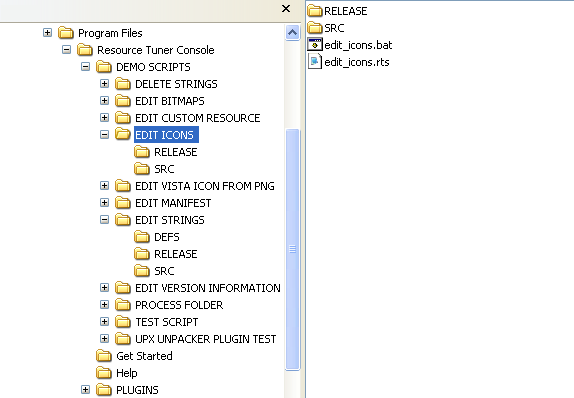 Within the EDIT ICONS folder there are also two files: edit_icons.rts (the RTC script, it's a plain text file, you can open it up with a text editor) and edit_icons.bat (the batch file to call the RTC script). The SRC (Source) folder contains all the files needed to perform icon manipulations: the target file DemoApp1.exe with an ugly stretched default main icon, and two icon (.ICO) files. The vista_iconset.ico file is an icon set stuffed with multiple icon images of all sizes and color depths including the high-resolution Vista icon. The icon_3_32x32_8bit.ico file is a single 32x32 icon. The RELEASE folder is currently empty. This is where we are going to save the modified EXE file. Note: You can place the source .EXE and .ICO files wherever you want, in any directories, but you will have to replace the paths to source and destination locations in the provided sample script. Now we are ready to replace this single main icon with 10 new ones, and add one extra icon to the newly created icon group. 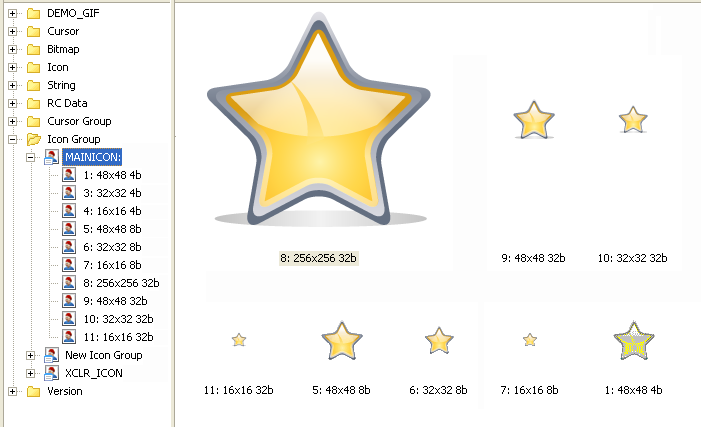 In this example we use 2 different icon files on purpose just to show you the flexibility and power of ResourceTuner Console. That's it. The icons have been changed within one second, the modified file DemoApp1.exe has been saved to the RELEASE folder. As you can see, a newly created log file log.txt has appeared in the EDIT ICONS root directory. The pathname to the log file location is specified in the bat file code. Not only does Resource Tuner Console handle the large Vista icons in .ico format, it supports adding Vista-style icons in .png format from stand-alone .png files. 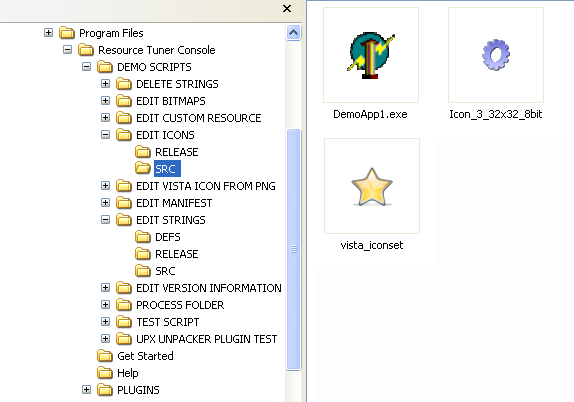 For greater detail, explore the EDIT VISTA ICON FROM PNGfolder. If you have questions about Resource Tuner Console, please contact Technical Support.